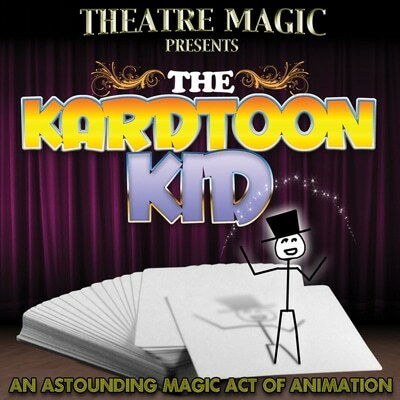 Kardtoon Kid is the perfect card trick for people who think they hate card tricks. 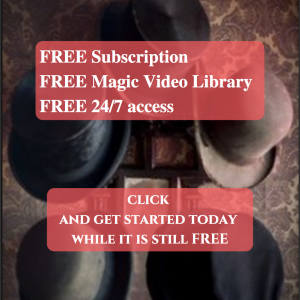 It is one of those novel almost self-working tricks that is so unique, your audiences will have a hard time believing what they are seeing. Kardtoon Kid is similar to the Invisible Deck & the Brainwave Deck in that a playing card is freely named by a spectator and is revealed in an incredible manner. Yet, with Kardtoon Kid, the card is revealed in a very unexpected way using a completely different method! The difference is that instead of the named card being found reversed in the deck or having a different colored back – it is revealed by flipping through the deck like a flip book and a stick drawing of a magician becomes animated, reaches into his hat, and removes the exact card someone just named! There it is, THEIR FREELY NAMED CARD, drawn in permanent ink held in the stick magician’s hand. The spectator can truly name any one of the 52 cards in a deck and the Kardtoon Kid will always make that card appear from within his hat. It is the perfect combination of magic & art! Kardtoon Kid is a relatively new effect in the genre of card magic. The original Cardtoon effect was developed in 1992 by magician Dan Harlan and has seen many incarnations. I have always loved the traditional animation of the drawn magician pulling the chosen card from his hat. This effect is so good, in 2015, Jamie Raven closed his performance on Britain’s Got Talent with this incredible trick and completely blew away the judges! Kardtoon Kid can be your powerful reputation maker as well! 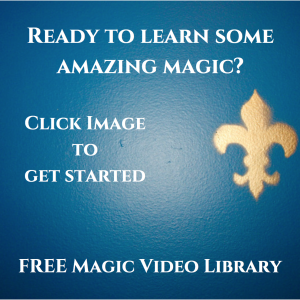 One of the problems frequently mentioned with card magic is that few card tricks can be performed for young children. Younger children may not understand the complexity of plot in many modern card miracles. However, the element of animation present in the Kardtoon Kid offers something special that every child will recognize and that every adult can enjoy as well! This makes it the perfect walk-around piece of card magic to perform for kids and family audiences. It often creates a great buzz when I perform for different groups of people at the same event. Soon, everyone is comparing their magical experiences and they all come to realize that the Kardtoon Kid was able to find each and every one of their cards and that the cards chosen were all different! So, although it is the only trick the Kardtoon Kid really knows… He can do it 52 times with completely different results! If you own a Kardtoon Kid deck, it is important for the cards to remain in the correct order so you must never shuffle the deck. Some may consider this a drawback. However, logically, the cards must remain in order for the animation to properly occur – much like how Disney animators used to put the proper cell drawings in the correct order to create a full movie. Also, if questioned about this, I explain that having the cards in order also helps to easily find whatever card is named without having to waste a lot of time searching for it. This usually satisfies the spectator’s suspicions as to why the cards are in order – if they are even that curious. Kardtoon Kid also makes the perfect OUT! As mentioned in previous articles, an OUT is when the magician has a way OUT of a sticky situation such as having actually lost a playing card in the deck with absolutely no way of knowing what that card is or revealing it an entertaining or satisfactory fashion. Kardtoon Kid can save you in these situations by giving you a highly visual way of revealing the chosen card. I also regularly use Kardtoon Kid when challenged by a spectator who asks, “What card am I thinking of Mr. Magician?” My reply is, “Oh I have no idea. I’m not a mindreader, but THIS guy is!” I remove the Kardtoon Kid deck from my pocket and proceed to have them name their card only to reveal that the Kardtoon Kid knew the card the entire time! The proof is in his hat!